Sometimes people ask us if we get tired returning to the same places year after year. For me leading a group of people is not about revisiting the same places over and over but rediscovering them anew with people who are usually experiencing them for the first time. As Henry Miller wrote, “One’s destination is never a place, but a new way of seeing things.” I typically tell people in our opening meeting that for me it is a privilege to journey with others because it gives me the opportunity to witness that process of discovery, wonder and enjoyment in others that is potentially a great part of the travel experience. Sometimes people are deeply moved by their travel experiences with us and share how they have been inspired, healed, uplifted or pleased way beyond their expectations. Being a part of that process is deeply rewarding and keeps our energy high and is what motivates us to continue packing our suitcases, farming out the kids to their grandparents and giving ourselves completely over to our groups during our time together. In essence, leading groups is often more about the people than the place – it’s about you! In my article on pilgrimage in the Internet Age, I describe the changes I’ve witnessed in the Camino over the last 25 years. For me the most significant change is the rise of the Internet and the development of mobile technologies that have dramatically changed the mental experience of the 21st person, in general, and the Camino de Santiago pilgrim, in particular. The Camino is an ever-changing phenomenon (and has been since its birth in the 9th C) reflecting the salient issues of larger society in each period. I have had the great fortune of living through and researching the unfolding of these changes. For the most part, people are largely unaware that their digital habits potentially have a great impact on the pilgrimage experience due to the increased mental distraction the use of digital devices typically entails. How one uses a digital device greatly affects how one engages with the Camino, with oneself, nature, home, the world and the Camino community. While 21st C pilgrims are still physically present on the Camino in body, mentally they are “off the Camino” to a degree never before seen in the history of pilgrimage. Before starting the Camino de Santiago pilgrimage, you might want to reflect on a few questions, such as: “Why do I want to go on the Camino?” What do “Camino” and “pilgrimage” mean to me? Am I looking for a profound inner journey? Do I want to walk and share my experiences with friends and family to have a shared, open Camino? Or, do I desire to “get away from it all” with some quiet, personal time away from the worries of the world? Is this a ‘bucket-list’ experience, or a religious or spiritual journey? Maybe you don’t know. That’s okay, too. People sometimes just feel drawn to the Camino without really knowing why. Nonetheless, reflecting on why you are going, may help you to make choices regarding the use of mobile tech that will make it easier to achieve your goals. Be aware that your initial reason for going on the Camino may evolve over the course of the journey. New spaces and places, experiencing new sensations and different ideas from others, as well as facing challenges can leave their mark. Consequently, the meaning of the journey can grow and develop as you go due to the reflections you make or changes you may experience from the beginning to the end (and then in the return) of the journey. Be open to these changes and allow yourself to adapt to the circumstances. Try to let go of the need to control all aspects of the journey and take them as they come. If adversity arises (which is normal), take a deep breath and try to deal on your own. Studies show that people regularly self-assess their tech usage levels very poorly and generally underestimate their real time usage, number of daily pick-ups, and checking of devices. How and when do you use your tech? In what contexts do you find yourself using your tech? Self-analyze and reflect on when and how you use your tech – habit, need, boredom, work, discomfort, to communicate, check on others, etc. If you use your tech, for example, when you’re bored at home, you’ll probably use it on the Camino when you’re bored, too. Ask yourself – why do I always keep my mind distracted? Studies also show that distracted minds typically don’t feel as fully, don’t reflect, don’t focus as well and don’t discover what’s underneath the surface. What would happen, for example, if you allowed yourself to be bored and just be in that moment without having to “do something”? What might you discover? Is our tech usage a great way to distract ourselves from ourselves? If the thought is scary, causes anger or instant rejection that means it’s probably a good idea to try and explore it. Finally, ask yourself: Do I want to have a different relationship with mobile tech on the Camino than I do at home? Do I want to tell my boss/friends/family that I will not be taking calls, answering messages and being “on call” for what happens “back home/work”? If I do want to have a different relationship with tech on the Camino, what changes do I need to make to do so? What do I recommend in terms of preparation? Prepare but don’t over-prepare! It is important to prepare mentally and physically for the Camino but it is also essential to draw a line on the amount of preparation, especially mental preparation. The hazard today is to OVERPREPARE mentally. It’s essentially a control issue. Fear of the unknown is real, of course. Therefore, to try and diminish potential anxiety levels, preparing helps you to make the unknown a bit less unknown. The problem in the Internet Age is that you can know way too much about the unknown, so much that it takes away from your experience once you are there. DISCOVERY, SURPRISE and WONDER are an essential part of a journey and a pilgrimage is then a step into the unknown intentionally because, as a rite of passage, a pilgrimage entails some kind of personal trial, adversity, discovery, challenge to grow, and to learn and develop something new inside of oneself. For example, if you plan to go see a movie and before you go you watch the trailer, read reviews about the movie (often with spoilers) and comment on the movie in a forum even before you see it, how does that impact your first time viewing? Probably very significantly. It’s the same with the Camino. If you spend hundreds of hours online (as people do) looking at every corner of the Camino, connecting through groups with other people, hearing about issues on the Camino ahead of you, posting on forums, what does that do to your experience of discovering it for yourself? Take it as it comes. People have always had pre-Camino jitters. The difference between pre-Internet and now is that pre-Internet you eventually had to let go as you did not have a device that allowed you to cling. Now we have devices (mental crutches) that allow us to fret and cling and consequently we don’t choose to let go and allow ourselves to trust what might be, let experiences simply happen and discover many things about ourselves in the process. With increased utilization and incorporation of mobile tech in daily life, there’s an increased lack of trust in the self to deal with circumstances/adversity/life situations as they may arise. Rather the trend is to prepare for every single possible thing that might “go wrong”. Simply scroll through popular threads on Camino community groups and the minutiae that people worry about gets progressively more detailed: poncho vs raincoat, toilet etiquette, 30 tips for newbies, how to make friends, pilgrim tattoos? There are just some things that you learn as you go and you don’t need to fret about it ahead of time! It’s part of being a pilgrim! Facing adversity is part of the growing process. Everyone starts green and must learn as they go! 5) How will I communicate with HOME: family, friends and work? Before you go, discuss expectations and establish norms with friends, family and work about how to handle communications (in both directions) while you are away. Pre-Internet, home and the pilgrim accepted that contact would be limited. Separation from a loved one was rationalized by the adage: No news is good news. Nowadays, no news for a couple of hours sends some people into a panic. On the Camino our digital world allows instant connectivity between home and pilgrim in a way that never existed pre-Internet. Is this what you want? Do you want to have physical AND mental time away or do you want to be mentally at home and on the Camino simultaneously? Keeping up with family and friends through emails, photos, social media can be very time consuming and emotionally exhausting. Do you want to spend your time on the Camino that way? Also, do you want to be aware of everything going on at home (the cat in the tree, the failed math exam, the unpaid bill, etc), stuff you can do nothing about when you are physically away? Pre-Internet no one had to ask themselves these questions because home and the traveler/pilgrim had a clear break and separation that lasted for an extended period of time (except for occasional letters or phone calls in the 20th C). Another old adage was “Distance makes the heart grow fonder.” Having real mental distance and physical time away, allows you to look at your relationships more clearly and to feel more powerfully emotions of longing and love or perhaps relief and joy at being separated. The mental and physical distance helps you get necessary perspective on your life. If you’re always mentally connected on the Camino with loved ones through texting, emails, photos, updates, etc, you make it very difficult for yourself to get the necessary mental distance to reflect on the deeper meaning of your relationships. Would potentially limiting your communications with family be difficult? Probably, yes, but we return to the idea that some mental distance and adversity on a pilgrimage/journey is good and necessary. Pilgrimage is typically tough both mentally and physically. It’s a powerful rite of passage where the self is often tested. Mobile tech allows us to reduce the mental trials inherent in rites of passage that have characterized the human experience since time immemorial. There is nothing wrong with feeling lonely, bored, sad and/or doubtful AND it is a completely normal part of the process! Many people find themselves emotional, confused or crying on the Camino and they don’t know why. That’s okay. It is a typical part of a pilgrimage process (rite of passage) when you are outside of your comfort zone, away from your normal life and are in the process of challenging cherished held ideas, or pushing yourself in new ways or questioning who you are and what you are doing on the Road. When you give yourself a chance to feel these things and reflect on why it can become a great opportunity and a growing process of the self. Being tightly and safely connected to your mobile device will keep you away from the opportunity of having these remarkable, tough and profound human experiences in such an incredibly, safe and fabulous place that is the Camino de Santiago. 6) Desire to be tech connected can evolve over the course of the journey. Typically, pre-Camino anxiety, the fear of being ‘out of touch’ as well as the excitement of sharing the journey with friends and family, keeps people tech connected early on in the Camino. When people start walking and experience the joy of being in nature and a community of open pilgrims, one’s sense of time and place changes. There is a growing sense of enjoyment and fulfillment in being in the now, with your thoughts, with yourself, with others around you, in nature and the need/desire to connect to the Internet often diminishes. Be prepared for the possibility that you will feel less desire to connect to the outside world and trust that natural response which urges you to connect to the present simply be where you are. Writing to friends and family (or your public blog, etc) on a daily basis may come to seem like a chore as it can be very time consuming. Trust that feeling and allow yourself to be on the Camino and not tied to your device and the mental connectivity and distraction of things going on someplace else. If you are concerned about family members, warn them ahead of time that your communication frequency may vary as you go or agree to send out a group “I’m okay” message from time to time. 7) What relationship with tech do I want to have on the Camino? Everyone needs to make their own choices regarding tech usage on the Camino, just try to make sure they are conscious choices. Everyone’s circumstances are different. Consider making some tech usage rules for yourself pre-Camino. Suggestion #2 encourages you to self-assess your usage patterns at home. Do you want to maintain the same mental relationship with the internet that you have at home on the Camino? If you don’t, then think about this ahead of time. Free WiFi is more and more available on the Camino and it will be progressively easier and easier to connect 24/7. Do you want to be available 24/7 when you are on your pilgrimage? Would you like to use the Camino as an opportunity to limit your connectivity to certain types of social media such as Facebook, Reddit or Instagram or the like? Establish a “switch-off zone” where you turn off your phone while walking or other segments of the day. Turn off certain features of your phone while on the Camino – notifications, certain apps, incoming calls, etc. Typically people have no personal tech rules and every single time they take a photo or stop at a bar or café en route they take out their phone and check whatever. Others use their devices for entertainment (music, books, movies, etc) at the end of the day. Some people connect to on-line dating sites, sports groups, world news and stock reports and there seems to be little distinction between being on and off the Camino. The more connected you are mentally to the world via the Internet on the Camino the less you are in the Camino living, breathing and experiencing it fully in body and mind. You are depriving yourself of the opportunity of receiving one of the Camino’s most precious gifts: freed up mental space. When people have this opportunity of freed mental space, 21st C pilgrims typically try to instantly fill it with noise from the net, home or the world. Why do we discard so readily what the Camino offers? Many people want a “time out”. Why not give yourself one? You might ask: Why would someone want freed up mental space? If you want me to answer that question, let me know. If you decide to limit your tech connectivity on the Camino, be prepared for the possibility of withdrawal symptoms. A well-known, documented phenomenon among habitual mobile tech users is called “phantom ringing” or “phantom vibration” which occurs when a habitual user stops using their devices for a period of time and will hear or feel the phone even if it is turned off. I interviewed a Swedish woman who decided to do a “digital detox” on the Camino leaving behind her phone. She experienced this phantom ringing phenomenon and told me it took her at least 10 days for her to feel that her over-stimulated mind start to calm down and that she could enjoy the Camino more fully. It is normal to have tech withdrawal symptoms or anxiety for habitual tech mobile users when they stop using them. Once you get past that stage you will feel more alert mentally, begin to perceive more with all of your senses, focus better, decrease your inner need to connect to the web and feel the present more strongly. You will feel more alive and engaged with your body, surroundings and others and less inclined to look to your phone for solutions. The tech industry has developed a whole series of wonderful apps that allow us to self-monitor all of our bodily functions – steps walked, heart rate, water consumption, distance covered, speed, hours slept, night movement, and so on and so on. These apps are very interesting and can serve an important function but in the context of the pilgrimage, I would encourage you to ask yourself, “Is it really necessary to monitor my body in this way?” It ends up being distracting and another example of too much information. By focusing on the minutiae it can lead to greater stress, something to be worried about or distract you. Just give your mind a break! One of the gifts of the Camino is learning to listen to your body and knowing when you are hungry - to eat, when you are tired - to stop and rest, when your feet have pain - to stop and tend to them. When we ask these monitoring devices to listen for us, we diminish our ability to hear our body’s signs and listen to them ourselves. We end up giving these devices a tremendous amount of power over us as we begin to trust them more than our own instincts. Remember that these tech products are designed intentionally to be addictive and to erode your confidence in yourself so that you will consume more of them. People often claim that using a Camino app is the same as using a guidebook. Or, that writing in a diary by hand is the same as writing an online blog. On the surface they may appear similar but they are very different how they affect you mentally. In both cases, the guidebook and the handwritten diary, anchor you to the present and help keep you in a bracketed period away without external influences and feedback. Reading about the next day’s stage in a guidebook has a limited frame of reference and consumption of time. The tendency when reading a stage on an app is to spend a significantly greater amount of time due to the many distracting elements which encourage you to seek further information about many different aspects of the journey – lodging, where to eat, comments someone made about this or that, what to do or not to do. Before you know it, you have been sucked into a series of articles or posts and spent much more time than if you had simply had the fixed, sufficient info offered in the guidebook. In terms of a diary vs a blog, a diary is private, of the moment and may or may not be shared with anyone in the future – usually not. Writing a blog almost always implies an audience which can be very small (family and a couple friends) to a very large, unknown audience. The tendency when writing for an audience is to create a version of events for that audience. Depending on how the blog is set-up, the pilgrim may or may not receive instant feedback. Whatever you choose, be aware of the hazards that an app or a blog will have on increasing your mind’s distraction, time spent on line and less time spent physically and mentally where you are. Habitual mobile tech usage has created new needs and new neediness in 21st C pilgrims. One of these new needs is the daily internet fix, ie, “tech time.” Tech time consists of a window, usually after checking in for the night and doing a few basic chores, to settling down for a period of time to do a series of internet activities that may include: checking and answering messages, catching up with the world, processing and sending photos, blog writing, social media posts and updates, planning the next day, entertaining oneself, etc, ie, disconnecting mentally from your immediate reality and sharing in some way the day’s events via the internet with a larger audience. People often sit in common rooms, where the band width of the WiFi is best, and connect to their devices and disconnect or tune out of the world around them. Due to the rise of the Internet, a new concept of “being away” and “doing the Camino” has evolved in the 21st C Camino experience: the Camino is when I walk and then I have “free time” to do other stuff. Before the Internet Age, the Camino existed outside of “normal time” and was a complete, bracketed experience of time away in a very different space and place. Our devices now allow us to rupture constantly our sense of being away in a new place, space and time. It’s much harder to listen and flow into the cyclical sense of the Camino and perceive the “out of time” feeling that once was normal. The current trend is to constantly break up the day into mental engagement and disengagement rather than give oneself a long, extended period of mental disengagement over days and weeks. Rather than a mentally freeing space, the Camino potentially becomes a very busy place mentally where people feel stressed about all the “stuff” they need to do during their “tech time” to keep up, the family informed, and the audience happy. People also start to complain about the poor WiFi that doesn’t allow them do what they want so they can have more free time on the Camino. For some, this adds a layer of stress never before witnessed in pilgrimage as an experience! 21st C pilgrims choose to keep themselves busy, distracted and mentally burdened to a much greater degree than ever before. Why? Extended Tech Time takes us away from the present that is the Camino as a whole and we lose the possibility of living it fully. Try keeping your head out of the Cloud! 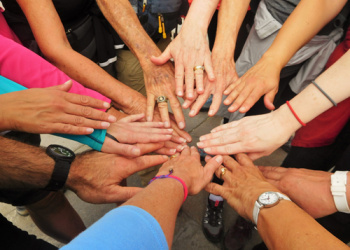 A great part of the Camino pilgrimage experience is the Camino community and developing a feeling of belonging. On the Camino you will encounter many different tech mobile usage patterns among pilgrims that mirror what you will find in daily life. You may be eating at a table with other pilgrims who will multi-task your conversation by using their phone while chatting with you. Or, you may encounter people who entertain themselves before going to bed with iPads, reading with bright lights and the pinging of notifications coming in. You may find yourself alone during “tech time” if you don’t connect with your device. If you choose to go less tech connected than others, you may end up feeling more isolated from some of your companions. These can be opportunities for reflection, conversation, or compromise. It is now part of the 21st C journey and reality. Reflect on how your actions, and those of others using their tech, potentially impact the community. The tendency in the Internet Age is to try and do everything “right” and have the perfect Camino with no glitches, no worries and no problems. There is no perfect Camino. Whatever you do, is your Camino. People frequently ask is it “cheating” if I do this or that. There is no official Camino “rule book. “ There are a lot of unstated, and often conflicting, norms among pilgrims that is part of the “Camino culture” of the late 20th C and early 21st C experience. The seeming ease to have the “real”, “authentic” or “right” Camino is heightened in the Internet Age with the rapid transmission of constantly updated information by an infinite number of experts. Platforms, such as TripAdvisor, are used by pilgrims to rate albergues, monuments and experiences that generate opinion on what is the “best” among pilgrims. We bubble wrap our experiences by always following the Trip Advisor recommendations to make sure “nothing goes wrong”. Pilgrims often read and trust these recommendations on line rather than simply explore on their own. By following all of the “recommendations” to have the “perfect Camino”, you limit your choices, your own criteria and miss opportunities to experience something for yourself. You let other people choose for you and, in the process, lose the diversity of the experience. The problem is if you don’t check stuff out yourself from time to time, you limit your opportunities to learn or grow and you decrease your face-to-face encounters. There’s nothing wrong with things “going wrong” from time to time – it converts your travel experience into a journey, into an adventure and these “bad experiences” often make the best stories in retrospect. 14) Try to deal first on your own before turning instantly to your tech to resolve a moment of adversity. Reflect on how and when you use your tech on the Camino. As people become more and more dependent on their mobile devices, when adversity arises, the trend is to more and more quickly turn to the mobile device for the solution rather than try to work it out for oneself. People believe they are more independent but, mentally, they actually become more fragile and dependent on their devices to resolves situations when the “going gets tough”. What do I mean by the going getting tough on the Camino? I dedicated a chapter in my 1998 book Pilgrim Stories to the “Landscapes of Discovery” in which I describe how the obstacles that people overcome typically become pathways to growth, confidence and self-empowerment. One common “trial” that people face is “getting lost”. Someone will be walking along, lost in their thoughts and then realize that they don’t see any more yellow arrows marking the way. In the Internet Age it is easy to simply take out your phone, connect the map/gps function and follow its directions back to the Camino. Of course there is nothing “wrong” with doing that. What I am suggesting is that you try to first figure out where you went wrong, ask someone who might help and/or work it out for yourself. We atrophy these “dealing” skills when we delegate them entirely to our devices. The number of moving stories I have of people feeling lost and then “found” by another pilgrim, a villager or circumstances is large. These became part of the pilgrim’s journey - lessons in humility, trust or fortitude. Self-reliance is a wonderful skill to develop and sharpen in the safe space that is the Camino. When we lose that self-reliance, we look to our phone and then others to get us out of a tough situation because we don’t realize that often we, ourselves, have the power to resolve our own problems. People end up abusing expensive emergency services because they instantly panic and expect that someone else will resolve their problem for them. 15) Memory and Sharing. You don’t have to remember and share everything! In our world of instant share and constant photos, people express concern about that they won’t remember if they don’t record everything. Recording, photographing and sharing becomes another layer of work and stress on the Camino. Remember, it is okay not to remember everything that happens or to share everything. When we parcel out experiences through constant sharing as they happen, they potentially lose their deeper power in our total experience. It’s okay to keep things for yourself. Pre-internet most people did not have cameras on the Camino. If you did have a camera, the photos were never available until after you returned home. Experiences became internalized, mulled over, reflected upon over the course of the whole journey, of the entire bracketed period away. In the Internet Age, the tendency is to capture moments for immediate, rather than simply savor them in the moment. There’s a sense of an obligation to others (virtually connected to your Camino) and to oneself to record as much as possible that exerts pressure on 21st C pilgrims. I have observed repeatedly with some 21st C tech pilgrims is the “I came, I took the photo, I left” phenomenon where a pilgrim arrives at a monument that he/she has probably heard is worth seeing, gets out the phone, takes two or three pictures and then moves on without pausing to observe, go inside, read about it, etc. You can almost hear the inner dialogue: I’ve got the photo that means I’ve “done it”. What’s the point of taking a photo except to remind yourself that you were actually there at some point? It’s like having a Camino photo album but with no experiences behind the photos – Camino of photos but not a Camino of emotions. The Camino de Santiago pilgrimage offers the ideal environment to disconnect from the worries of the world and connect to a generous community of fellow travelers. The opportunity to take time out and enjoy the simple gifts that the Camino offers, including potentially freedom from mental distraction at least for a limited amount of time, is precious. It’s up to each person to choose whether or not they want to experience that gift or not. Buen Camino! 1) Reflect before going. Why am I doing this? What is the Camino? What is pilgrimage? 2) Be cognizant of the fact that motives often evolve. Be open to change. 3) Self-monitor your tech usage before going and ask yourself if you want your usage to be the same on the Camino at home/work life. 4) Prepare mentally and physically for the Camino but watch out for Information Overload. Draw a line and resist over-preparing. More information is not necessarily better. 5) Talk before going with family, friends and work about communication expectations on both sides. Do you want real mental distance or do you want to be always intermittently connected? 6) Like motives, your desire to be tech connected often evolves on the Camino. 7) There are many ways to be more or less tech connected on the Camino. Reflect ahead of time about how you might want to manage your connectivity. 8) Sustained disconnection from your mobile tech in habitual users can cause withdrawal symptoms. Be aware of this phenomenon. 9) Question gadgets and apps that encourage mental distraction such as “self-monitoring devices”. Ask yourself, do I really need these on my pilgrimage? 10) Consider using a guidebook vs an app. A guidebook anchors you to the moment, an app (usually) encourages your mind flit around endlessly. 11) A brand new phenomenon of the 21st C pilgrimage is post-walk “tech time”. Reflect on how engaging in this practice undermines your bracketed time away, quickly fills up your freed up mental space and ends up distracting you from being where you are – on the Camino. 12) A great part of the Camino pilgrimage experience is the community and a feeling of belonging. How other people manage their tech also impacts greatly the on-the-ground pilgrim community. Reflect on how your actions and those of others using their tech potentially impact the community. 13) TripAdvisor can be a great tool but in the case of the Camino allows you to bubble wrap your experiences without taking any risks, trusting instincts, exploring on your own, making mistakes – all the stuff that turns a trip into a journey. There is no perfect Camino except your own. 14) When something “goes wrong” try to figure it out first before instantly turning to your phone for the answer. Self-reliance is a fabulous skill to develop and sharpen on the Camino. 15) You don’t have to remember or share everything! Trust being in the moment, rather than always capturing the moment. Savor special sights and moments for yourself from time to time. *** CAVEAT: This article is not “anti-tech” nor a nostalgic look to the past. I am very aware that our tech industry-driven society now requires us to have mobile phones for many tasks and there are many features that are very convenient and useful. I am not saying that “tech is bad!” I am suggesting that you probably need a lot less tech in your pilgrimage experience than you might imagine! In fact, engaging less with your tech will give you more real life, face-to-face human experience! Also, I am not judging people who use technology or saying that using tech on the Camino will ruin your experience or that having a phone or checking with your family is “wrong”. I am speaking from 25 years’ of experience on the Camino doing anthropological research both before the Internet existed on the Camino and now that it is in full-swing. It is possible to see very clearly how tech usage impacts your mental experience on the Camino and there is a huge difference between these two periods. My point is to help you make real choices. Of course, tech offers many wonderful things to make our journeys easier and are very efficient for all sorts of tasks but that’s not necessarily the stuff a pilgrimage is made of. Furthermore, I am not talking about have a more REAL OR AUTHENTIC experience. Each person needs to find and create their own authenticity and there is no magic formula that will do this. What I am trying to do is to help people engage more profoundly with the Camino, to get below the surface and discover themselves more intimately. I am not saying this is the right way, the authentic way or the best way. If you have any questions or comments for Nancy on her articles or research, please write to her at: . On our Camino de Santiago tours we gift our walkers scallop shells, the primary symbol of the Santiago pilgrim. We gather these shells ourselves from the Ría de Arousa in Galicia, the very same estuary in which the Apostle James’s stone boat sailed looking for safe harbor before eventually being buried in what came to be known as Santiago de Compostela. This image of St James/Santiago (note he’s standing in a boat dressed as a pilgrim) comes from the town of Ribeira on the Ría de Arousa. In winter we like to go with our kids to a favorite set of beaches to find shells, beachcomb and enjoy this magical, remote spit of land in the sea. Beachcombing is a marvelous, relaxing activity that we enjoy together as a family and individually as we discover the wonders to be found on these magnificent beaches. Here Sam sits in the distance floating atop a sea of shells. We've reached the first set of beaches. The beaches lie at the mouth of the estuary where the open ocean batters the coast. Striking deep mustard-yellow lichen adorn the granite boulders. Scallop shells start to appear - buried beneath other shells, wedged between rocks, in the water. Some shells are whole, others are broken, weathered or worn. Scallops come in many color variations and sizes. They are all unique like each pilgrim and his or her journey. Reaching the next set of beaches, we continue our trek out along this rocky spit that reaches out into the open ocean. It looks like we might be able to walk all the way to Sálvora Island but no chance. The urge to see how far you can go is strong. Scallop within a scallop - one of the many gifts from the sea. We each search for shells and anything that captures our fancy - sometimes together, sometimes alone. At high tide the water will cover this beach completely. We always keep one eye on the water to make sure we don’t get caught. Being out here is mesmerizing. When you get down on your hands and knees you realize that what looks like sand from the distance is actually an infinite mass of shells in various crushed states. As far down as you dig, all you can find are shells. The sea birds like to hang out here including many yellow-footed gulls, sandpipers and cormorants. The cormorants like to warm and dry their sleek black wings in the sunshine perched on the rocks. You can spend hours slowly combing the beach finding special treasures. Marina holds up a very large yellow-toned scallop. Jose and Jacob showing some of their finds and Jose holds a stunning pink-tinged scallop. With an eye on the rising tide, we reluctantly make our way back across the rocks to the mainland sorry that they treasure hunt is over. At the end we pull out our collection of shells and select the ones we can use to gift to our walkers. Inevitably our pockets are filled with sand, polished beach glass and other eye-catching bits and pieces of beach. Now back home for cleaning, drilling and red cords to be attached for our walkers (to be continued…). In January 2017, I gave the keynote address at the Confraternity of St James’ Annual General Meeting in London titled The Smart Camino: Pilgrimage in the Internet Age. In the talk I briefly review some general changes I’ve noticed over the last 25 years and then present my research on the incorporation of new media technology into the Camino and how this has impacted being a pilgrim. The rise of the Internet is the single most important change in the Camino during this period and has dramatically impacted how people engage with the pilgrimage experience before, during and after the Camino is over. The video is long. To help facilitate listening to the parts that are of most interest, I’ve broken down the video into segments and themes. Please let me know if you have any questions or observations. • 21:33 - What happened to the wild dogs? 22:15-23:38 - Changes related to Internet Age. Tech is a tool but not a neutral tool. 23:38-26:44 - Pilgrimage/Camino is a Rite of Passage with three stages: Prep, During, Return. “While the physical component has remained relatively the same, for most people the mental component has changed dramatically…” The Camino in the Cloud. • 1:00:30 - Tech industry encourages us to trust tech and not ourselves; WiFi App; Progressively outsourcing skills to phone and atrophying those abilities within ourselves.